Once I committed to my fourth (and first road) ultramarathon with the inaugural UrbanICT, beginning at 9:00 PM on July 27, 2018, in Wichita, Kansas, because I no longer had easy access to the gym or pool, I based my training solely on running. I for the first time ever ran all seven days a week, which tensed up my left hip and lower back and reassured me I must cross-train for major races as I always had. The event commenced over ten degrees higher, on top of irritating humidity, than the Weather Channel predicted for weeks, but at least I did not have to deal with the sunlight, the only reason I considered an ultra in the summer. With this 50K being my 34th race, I hardly become nervous or even anxious before a running event anymore. A friend who participated in the 25K here asked me multiple times before the start, “Are you nervous?” and my answer being “No” each time in a way made me nervous. I opened up the first two miles running side by side and chatting with a former NCAA D1 runner, but I knew, although less boring, following the pace of this elite much longer would be a foolish strategy and let her go. I ran most of the first half nonstop and forced myself to slow down around 11 miles in, as I had not run an ultra or even a marathon since the 102-miler in April 2017 and was taking on this daunting challenge in the summer at night without sleep and after having driven nearly five hours from Nebraska the same day. 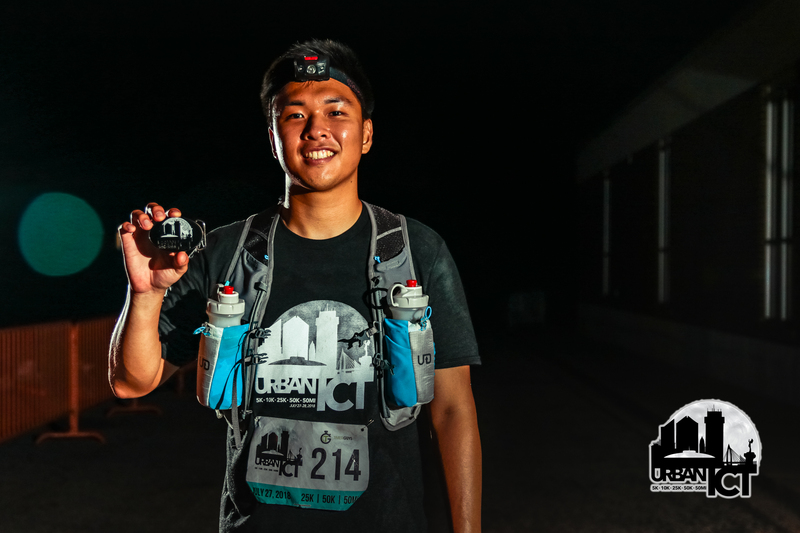 Unaware the course comprised consistent hills and took place on concrete, I knew my legs’ pounding the ground more heavily than on a trail could cause me to fatigue earlier than in my previous ultramarathons. 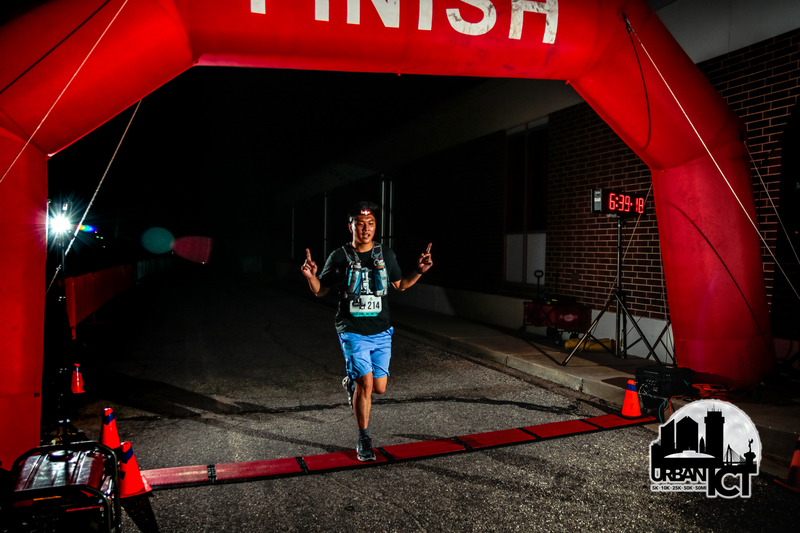 The event hosted over 500 runners in five distances, but not many participants signed up for the 50K; therefore, I ran alone in the dark for much of the race, making me vulnerable to boredom, drowsiness, and lack of motivation to push as hard as I physically could. Because I began to struggle slightly in the first half, mainly due to a stomachache from shoving in too much fluid, I initially thought my finish time would be a disaster of verging on eight hours. Being in solitude did allow me to focus more easily on praying to my only Source of strength, and unsurprisingly I felt revivified just past 20 miles to be back in the game. I thought of mostly walking for a mile or two around mile 23 prior to encountering a fellow 50K participant named Ruth. I asked her, “Are you a Christian? Ruth is one of my favorite books in the Bible,” and we exchanged testimonies and both noticed time flew for these two miles. Seven miles to go, I realized I could actually set a personal record (PR) in the 50K, bearing in mind a couple of hours previously I was worried about finishing in an embarrassing time, and repeatedly did math in my head to figure out how strongly I had to push and how many more walk breaks I could afford to materialize this goal. Furthermore, walking strangely felt more painful than running at times, likely psychological due to my Garmin moving extra slowly for the former. At the final aid station three miles behind the finish line, I knew I had this PR in the bag. The volunteer told me he would check my result to see if I fulfilled this objective, and I half-jokingly replied, “Pressure!” and took off. Assuming due to a combination of humidity and lack of sleep, I hallucinated five or six times, all involving seeing a person or people not actually present. This for real, I turned my headlamp to my right in the woods and spotted two bright red eyes that seemed to be of a cat sitting on a stump staring at me, and I instinctively assumed I witnessed a mountain lion, which concerned me for a couple of seconds until I reminded myself I had God. I crossed the finish line of slightly over 50K, 31.35 miles according to my Garmin, in 6:39:06, smashing my previous time from over three years ago by nearly 16 minutes. I had never experienced feeling so negatively about my performance and then shattering my expectations in the same race, and one runner commented that defines an ultrarunner, coming back from adversity, with which I agree. When I run, especially an ultramarathon, all petty pessimistic thoughts disappear for the moment and I wonder, “Why was I so worked up over these?” I really enjoy the physical-spiritual journey I undergo with my Father and how easily I am humbled, as I acknowledge I cannot do any of these without Him; specifically when I feel I am done and then become completely rejuvenated physically, I have no other explanation than His providing me with strength. Nobody forces me to run; I just love overcoming challenges that involve all the physical, mental, and spiritual, and I have not yet found a better way to do so. 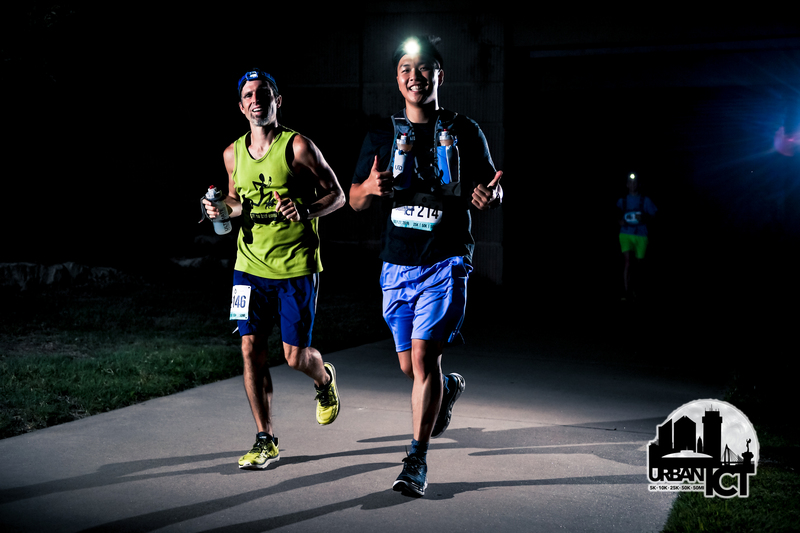 Committing to my fourth ultramarathon and second 50K in Kansas on July 27-28, 2018, I sought one more 13.1-mile race early in the same month as part of training. 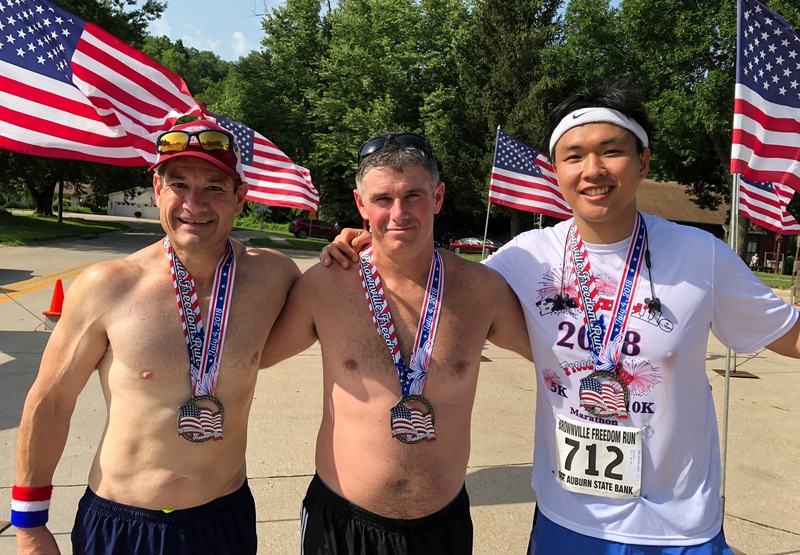 Seeing the Brownville Freedom Run as the only option on the Fourth of July, I signed up for the event for the second consecutive year, initially hesitant because I did not want to drive a minimum of seven hours out and back for a half marathon. Again, the temperature was projected to significantly peak on race day, but, having run multiple times in the 90s and 100s in training, I presumed my body would be accustomed to heat by now. This 9-year-old girl ran 13.5+ miles in these brutal conditions! Remembering the course from a year ago as mostly flat on a combination of road and trail, I did not prepare for hills. Nevertheless, before the start, the race director announced that the crew had to alter the first/last one-mile section of the course with hills and a bridge due to the flood on the original, and a runner next to me said, “I do not like hills.” Because I was conversing with other participants and missed this information, I asked, “How big are the hills?” somewhat implying, “How hilly could this possibly be?” The race commenced, and I thought emphatically, “What the heck is this?” as the first half a mile led straight uphill with the pinnacle hardly visible due to steepness and then the next half a mile straight back down; runners would repeat this in reverse order to the finish. Around mile seven, the clouds moved away from the sun, taking the feels-like temperature to the mid-90s; I felt I was running in the sauna and that I may have to vomit with all the fluid bouncing around in my stomach. One lady passed me on my way back up the brutal hill towards the end, and then I passed her on the way down. 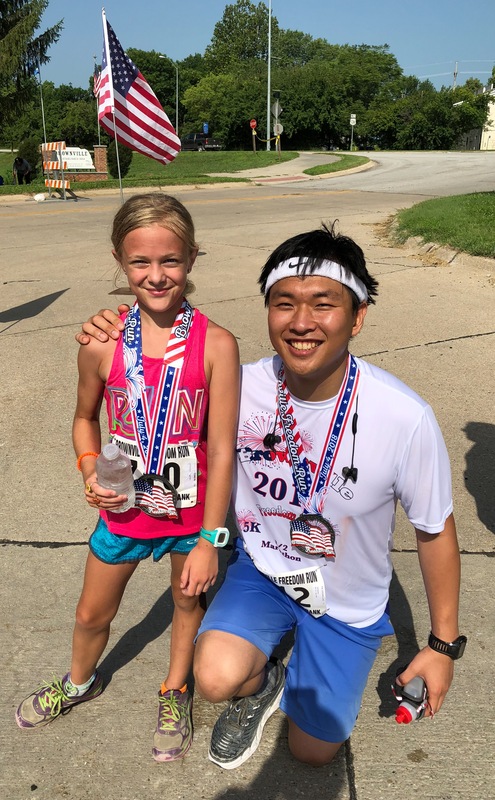 Here, she really pushed herself to try to pass me again and finish before I, and, wherever the energy came from, I probably ran the fastest pace here out of the entire race as if being chased by a bear. As soon as I crossed the finish line of 13.54 miles (although some GPS watches read closer to 13.7) in 2:20:04, I barely held myself from vomiting, simultaneously thinking, “I cannot puke in front of all these people.” (I did so big time twice on my way back to my disgusting hotel.) Seeing this terrible time place 24th out of 63 runners, I realized others were just as negatively affected by these conditions as I. I actually often feel excited and grateful when I struggle so much in the heat, as the more I do so the more I am reminded I did not run 102 miles in worse conditions alone; thank You, Jesus. Since my upcoming ultramarathon starts at 9:00 PM without the interruption of the sun, I remain optimistic I will perform.